Tagged under Pony Canyon, MOVIC, Series, Light Novel. Kraft Lawrence was an ordinary merchant until he came across the pagan wolf deity Horo, disguised as a cute wolf-girl. In exchange for assisting him with his work Horo asks that he take her with him to see the world and to find her home. Lawrence has no idea what he's gotten himself into, but accepts his fate to travel with her in search of himself and their fortune together. A fun, entertaining, romantic, yet serious anime set in the history of real world combined with the folklore tales... If that is the anime that you are looking for, the look no further, you just found one. The overall presentation of it is something that should be praised. Mostly because of their characters, their deep personalities and the world that is surrounded by them. Now we get here some negative things behind it. This anime may be confusing to some and boring at first. But even then, it only requires some basic history knowledge for you to actually understand it. I love this series and understand why this it's so beloved by many, Lawrence and Holo are amazing characters and their relationship is beautiful, heartwarming, and sweet. Their chemistry is outstanding and they compliment each other so well. I like how they're mature characters and that they respect one another, yet like to tease one another from time to time which is all in good fun. Jun Fukuyama and Ami Koshimizu are really great together in their roles as the character leads and I like when they work together in an anime. The story arcs are very enjoyable with the different people that Lawrence and Holo meet on their journey. I agree with those who want a 3rd season of this series made and want it too. I love this anime, its so much different from the rest. its nice to see an adventure anime for once.. not to mention horo is awesome. The atmosphere of this anime was perfect with its story and characters. Lawrence still has a lot to learn. 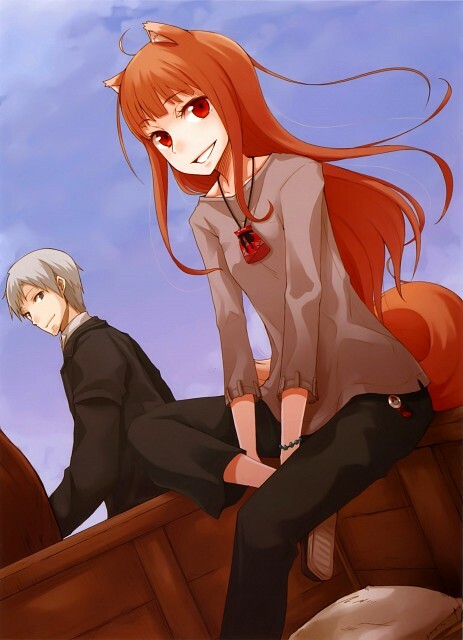 I was very surprised that I liked and watched Spice and Wolf. To be honest I typically don't go for those types of animes, but this one really dragged me into it slowly and I learned to love to watch Holo and Lawrence on there many endeavors. One thing I will say is it was a little dry for my taste, but I loved the artwork along with the time period the used. All together it was a beautiful series and I loved to watch it. A rather interesting Anime/Light Novel more concerned with character and story than others out there. With a firm grasp on what makes its' audience smile and happy, the author and artist continue to deliver never straying far from the road or using needless drama. Well worth the read and watch. The OP in the first season so beautiful that I could weep!!! I really loved this series, I don't know what to say.. It is something that really felt good watching and that will always remain in my memories. It might not be for everyone, but I do recommend it to anyone!! I love this series. Currently I am more focused on the manga than the anime, but for those in desire of a more classical tale without technology and futuristic influences. This is a great series for you to watch. It is filled with adventure, fantasy, romance, and many good laughs not to point a wolf's nose at. The adventure of Holo the wise and her companion which is a good merchant. Here begins the story of two ecctrentic people which strive to make lots of money in the trobuling times, to gain more you have to risk more and so the story goes, but don't think it is some boring tale about buying or selling, Holo is a wolf goddess and it creates problems but sometimes helps and they fall in big affairs as well. innovative topic for an animation. a story about economics, foregin currency and trading. unlike mainstream anime topics, this one is a nice break from all the usual drama. yet, with such a sophisicated topic demands some specific field of knowledge rendering it hard to comprehend at times. storyline surrounds the main male lead, felt a bit unbalance since there's minimal involvement from the female characters. relationships between two mains are a highlight. how they are prepared to overcome human-god boundary, such a topic has similarily been addressed in Ah My Goddess! Nicely done. Since I love wolves I had to check out this show^^ I loved Holo/Horo!!!! It was very cute and funny how she would act with Lawrence. The show overall was very enjoyable for me, I hope that maybe in the future a third season is made. Nice one.. more then having fun, i learned alot from this anime.. i wish to watch this kind of stuff more. I just loved it. Not an Anime for some1 who isn't interested in the medieval age, but if you are (especially in trading at that time) watch it. I rly love the romance between Lawrence and Horo and it rly dragged me into the life of a wandering merchant at that time. Watched the first few episodes. I was not impressed, however it is not unwatchable like some other shows. Graphics seem fine, sound is fine, however I just don't like any of the characters so far. Maybe that will change, however currently there is not a big urge too watch the rest of the series.